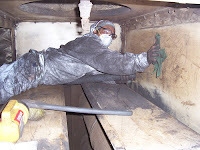 Confined Space Cleaning | Blackwell's Inc.
30 years ago we were known as Blackwell's Chimney Sweep Service. But a lot has changed for us since then. Back then, when the chimney sweeping period slowed, we needed something to do to stay busy, so we started doing pressure washing to supplement our work. We had the good fortune to apply what we learned from sweeping chimneys and pressure washing and started doing industrial cleaning, especially in the area of cleaning industrial ductwork. 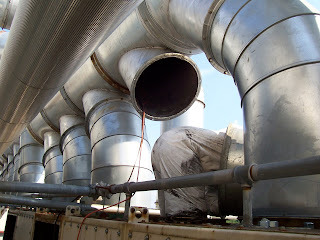 Chimneys and ductwork have at least one thing in common . . . they can be tight places to work. In todays arena, chimneys and ductwork, along with storage tanks, bins, vats, silos, ovens, and a whole host of others, are known as confined spaces. Workplaces are often considered "confined" because their construction design has limited openings for entry or exit, unfavorable natural ventilation, or has the potential to contain a hazardous atmosphere. Sometimes, and even though it can be a tight and dangerous place to have to work, confined spaces have to be cleaned or repaired, and special skills are needed to enter these places. 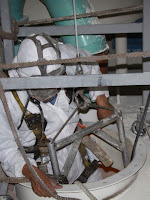 We are OSHA certified which means we have the skills, training, and safety equipment to go where others can’t. We are trained in the operation of personnel lift equipment and fall protection and we put these skills to use in our confined spaces work. Confined spaces are aptly named that for a good reason . . . there is no room for error.